Went out shooting yesterday morning for the first time in a while. I’ve actually been out very few times this year, I think. I haven’t counted, but a substantial portion of the images I have posted have come from a small handful of outings. Truth is, both shooting and posting have taken on some characteristics of a chore. I do it sometimes more out of inertia, obligation, or the worry that if I stop I might not ever start up again. One reason I haven’t been out much is usually that I end up thinking I can do it next week, and my large output from those handful of highly productive outings can disguise the lack of photographic drive. Fortunately I pushed myself out yesterday morning. 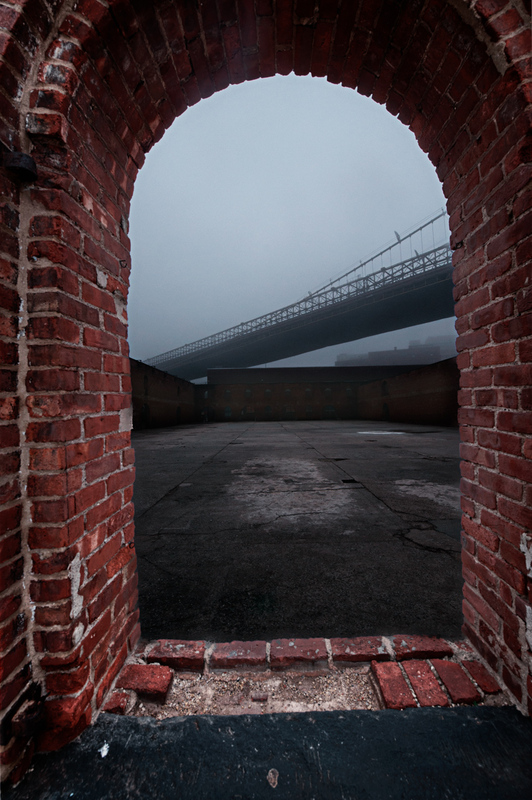 The forecast called for fog, and I planned to hit the DUMBO neighborhood in Brooklyn between the bases of the Manhattan and Brooklyn Bridges. It is an area I’ve shot before, but it is changing rapidly and I have surprisingly few fog shot of anything so the waterfront seemed a good choice. As it turned out I had a lot of fun, and got some shots I really liked, and have some new energy for photography. This is a warehouse that fronts Brooklyn Bridge Park. I believe it was abandoned and unused for a long time, and it appears to be in the process of being repurposed. Surprisingly, this entire section of it is open with no fence, door, barriers or even signs warning you to keep out. This shot was taken from the park, looking landward with the Brooklyn Bridge reaching towards the point where it meets the earth. This image was cataloged and processed in Lightroom. That’s a change for me– having always used Aperture until now. I’m thinking of switching over, so I’m going to work on this entire project (I know, that’s an Aperture term) using Lightroom and if I decide to switch I might try to convert all new shoots starting on January 1, but whether I switch is yet to be determined. Right now I’m completely in the annoying “why doesn’t this work just like Aperture?” phase, where I don’t know how to do basic things like export and crop. Yesterday was even more frustrating than usual because on top of all that, I suffered from what appears to be a somewhat common ailment for Lightroom on Macs, which is that for some reason the program has issues accessing folders in the Library directory and you have to change permissions or the program will crash, especially when trying to change into certain modules. In addition, plugins won’t install — even though the the installer claims everything went just fine. I’m actually a bit surprised I didn’t just pack it in and decide to stick with Aperture. I seem to have gotten all of those issues worked out so now I hope I can focus on using it, and deciding whether the features that attract me outweigh the features I know I will miss if I do stop using Aperture. Nice image, Mark. I really like how you framed the background with the red brick arch. Wonder what this would look like in monochrome. Glad you had a good shoot. I know what you mean about pushing yourself. I’ve had to do that lots lately but I’ve enjoyed the results.